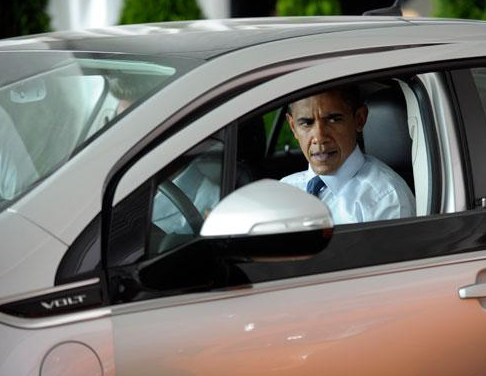 Obama better buy his Volt now … right now! Well, since GM has announced that it is killing the Volt, Obama might want to place his order pronto … and, demand a clearance price discount. All of this should come as no surprise to anybody. Forget cow tipping … there’s a new sport. Since the election is over, the T-Day conversation at our house shifted to “cow tipping”. So, let’s dip into the HomaFiles archive for the definitive explanation … with a twist. A news story caught my eye yesterday. Have you ever heard of “cow tipping? It’s a ritual where drunk farm boys sneak up on cows and tip them over. Technical note: I have no idea why they have to be drunk, but it’s always stated that way. 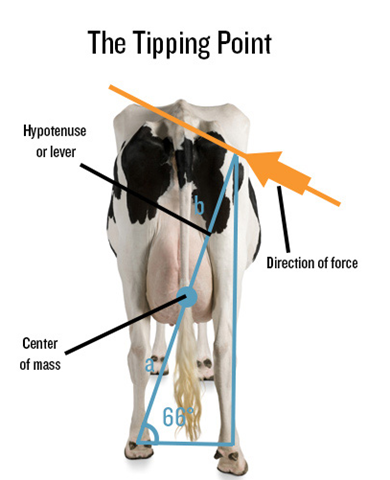 Last year , Modern Farmer magazine published a scientific study on cow tipping. Cow tipping, at least as popularly imagined, does not exist. Drunk young men do not, on any regular basis, sneak into cow pastures and put a hard shoulder into a cow taking a standing snooze, thus tipping the poor animal over. While in the history of the world there have surely been a few unlucky cows shoved to their side by gang of boozed-up morons, we feel confident in saying this happens at a rate roughly equivalent to the Chicago Cubs winning the World Series. Ignore the cheap shot at my favorite Cubbies … focus on the “boozed up morons” and the “laws of physics”. Maybe, the best commercial ever … n’est-ce pas? Have you seen the new Cadillac commercial? At several levels, I think it’s a great ad. At a broad level, it’s creating an incredible level of buzz. Fans on the political right see . . . an unapologetic ode to American values. Critics on the political left see it as Ugly American chest thumping at its worst. What’s got folks so stirred up? “We’re crazy, driven, hard-working believers. . . . . You work hard. You create your own luck. And you’ve gotta believe anything is possible. As for all the stuff? Crass ugly American materialism … or the American Dream? Watch the commercial and draw your own conclusion. The spot is well-done but philosophically odious. The surprising thing strategically is that they would choose to play to their base instead of trying to expand it. First, what’s odious about reaping some benefits from hard work ? Sure, it’s ironic that the commercial is coming from Government Motors … but should the company be touting the progressive mantra “liberation from work” ? I thought Cadillac’s base was NFL-NBA players and urban-based chemical distributors. Who else rolls in Sclades ? Note: I probably shouldn’t generalize from personal experience, but an NFL player lives a mile or two from our house. During the season, there are always 12 or more black Escalades parked in his circular drive. Place looks like a Caddy showroom. They are trying to “expand the base”. The Caddy ad caught my attention …. Guess what: Big batteries – when subjected to trauma – catch fire … whether in the air (787) or on the ground (Tesla). Earlier this week, a Youtube was posted showing a Tesla on fire. Yesterday, we posted some recent ASCI Customer Satisfaction survey results. Headline was that overall customer satisfaction numbers have been steadily increasing. Minor surprise was that autos sorted relatively high on the list. It has been a couple of years since I glanced at ASCI Customer Satisfaction numbers. During the 1990s, there was a pronounced drop in customer satisfaction … aggregated across all categories of products. But since 1997, there has been a steady improvement … reaching new historic highs. 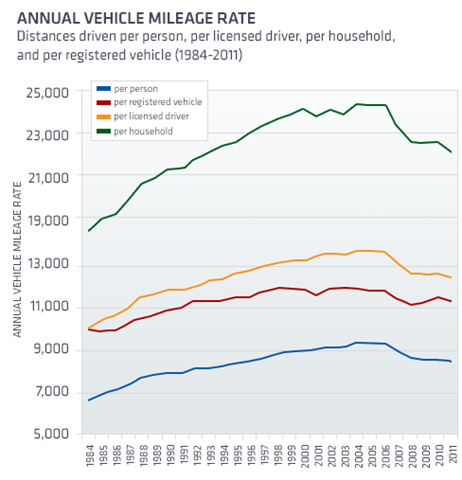 Driving in the U.S. reached a peak in 2004 and has been declining steadily ever since. A study reported by EurekAlert! – a science society — concludes that obese drivers are much more likely to die in car crashes than normal weight drivers. Nums: Which luxury car brand is #1 in the U.S.? According to Business Week, Mercedes has bounced back and regained the lead from BMW. Lexus has fallen to third. In the private sector, this would be be grounds for a perp-walk. But, not in government world, I guess. General Motors (aka. Government Motors) announced that it will purchase 200 million shares of stock held by the U.S. Treasury Department. The auto maker will pay $5.5 billion for the shares. The repurchase price of $27.50 a share represents a 7.9% premium over the closing price on Dec. 18. After the repurchase, the U.S. Treasury will continue to own approximately 300 million shares of GM common stock, or approximately 19% of the outstanding shares on a fully-diluted basis. GM expects to take a charge of approximately $400 million in the fourth quarter, which will be treated as a special item. Even at the inflated price, since the Feds bought i at the $33 IPO taxpayers will incur a trading loss of $5.50 per share … totaling to $1.1 billion. GM’s largesse in premium pricing the deal “saved” taxpayers about $400 million. Keep in mind, this is hardly an arm’s length transaction. And, we the people still own 300 million shares … representing a paper loss of another $2 billion. ExtremeTech.com says that “traditional” hybrids are dying. A pink car that prevents women’s wrinkles … really? 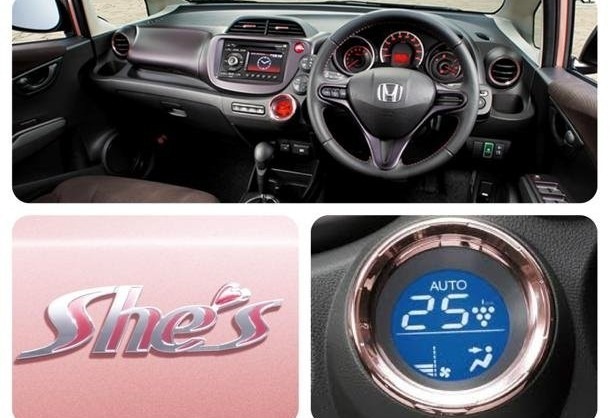 Punch line: Honda releases a new car targeted at Japanese women, boasting features that will prevent wrinkles. Available only in Japan, the make targets the nearly 50% of Japanese women who have decided to stay out of the work force. The car sports a pink exterior, pink stitching on the interior, and shiny pink chrome covers on the dashboard. They have even put a heart in place of the apostrophe in “She’s” to bring the point home. The first “designed for women” automobile since 1955′s Dodge La Femme goes beyond a superficial color treatment. With a new type of windshield said to block up to 99% of UV rays, women can drive to the grocery store confident that they are not increasing their chances of wrinkles. With the model’s “Plasmacluster” AC system, women can pick up their children knowing that the specially-treated air is improving their skin quality as they drive. Whether the claims are substantiated or not, the model will be sure to provoke conversation around the age-old question, “What do women want?” and open more than one can of worms for the Japanese automaker. In the last debate , Obama challenged folks to “check the record” re: what Romney said about the auto bailouts. Ok, we did … and it’s very interesting. Obama was talking about a 2008 op-ed in the NY Times. Yeah, the op-ed was titled “Let Detroit Go Bankrupt”. That’s inflammatory since most folks think that “bankrupt” and “go out of business” are synonymous. Bankruptcy is a process for stabilizing a failing company … not necessarily – and not usually – a liquidation (think practically every airline). Romney was arguing that GM should go through the process and follow the in-place bankruptcy laws … rather than having the Feds dictate the terms for winners & losers. What Romney opposed was dishing bailout checks … and letting taxpayers pick up the tab. No mention of letting the industry die. Obama better hope that nobody in Ohio or Michigan takes his advice and checks the record. While we’re at it … yes, there were winners – mostly members of the UAW. The profitable GM dealerships that were closed because they spoke out against the Fed’s bailout process (I personally know the principles of one such dealership in Baltimore). Again, Obama better hope that nobody in Ohio or Michigan takes his advice and checks the record. Again I ask, what are the odds? Well, according to the Detroit News, there have been about 16,000 Volts sold from its birth to date. According to the Dept. of Transportation, There are about 250 million registered vehicles in the U.S. So, the statistical likelihood of the next car I pass being a Volt is about .0064% … or, less than 1 in 15,000, given the geographic distribution of Volts. According to the NOAA, the odds of being struck by lighting in your lifetime are 1 in 10,000. Will GM go bankrupt again? That’s the question posed in a recent Forbes article that’s worth reading. The federal government owns 500,000,000 shares of GM, or about 26% of the company. Since GM’s IPO almost two years ago, the broader S&P 500 has gone up about 30%. During that period, Ford shares have gone down about 15%, Toyota up about 15%, Honda up about 5%, Nissan up about 35%, Hyundai up about 60% and Volkswagen up about 85%. It would take about $53.00/share for the gov’t to break even on the bailout. As a company, General Motors peaked in 1965, when it commanded 50.7% of the U.S. market, and made a stunning-for-the-time $2.1 billion dollars in after-tax profits. In the 1960s, GM averaged a 48.3% share of the U.S. car and truck market. For the first 7 months of 2012, their market share was 18.0%, down from 20.0% for the same period in 2011. GM is flailing in the D-car segment (Malibu, Camry) which accountd for about 20% of the U.S. car market. Recent (and forthcoming) versions of the Malibu score dead last in Car & Driver reviews. Holy Solyndra: Battery maker A123 Systems goes Chinese … ouch! 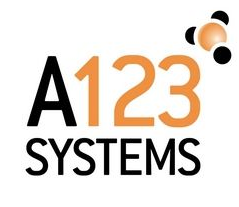 A123 Systems was supposed to be one the U.S. companies to propel the green energy revolution … by designing, making, and supplying batteries to hybrids and electric cars (think Volts). A123 received more than $200 million from venture investors before raising $378 million in a 2009 initial public offering. Also in 2009, it was awarded a $249 million green-technology grant under the Obama administration’s $2.4 billion Electric Drive Battery and Component Manufacturing Initiative. But, things haven’t been going so good for electric cars and A123. A123 said second-quarter revenue fell 53 percent to $17 million … the company’s second-quarter loss of was $82.9 million … and cash dwindled to the point that the company can only fund its operations for the next four to five months. So, according Auto News, China’s largest automotive parts supplier is now poised to take control of A123. China’s Wanxiang Group Corp. plans to invest up to $450 million in A123 Systems, taking an 80 percent stake in A123. Ken’s Take: So much for energy independence and government venture capitalism. GM market share slips 3 points … now, that’s a turnaround to be proud of. The President continues to tout his prowess as the venture capitalist who engineered GM’s bailout. Last week, GM canned its VP – Marketing after less than 1 year on the job. This week, the company released July sales results. Any wonder why the share price is about half of the IPO price? Near the end of 2010, GM acquired a new captive lending arm, subprime specialist AmeriCredit. Renamed GM Financial, it has played a significant role in GM’s growth. The automaker is relying increasingly on subprime loans. Potential borrowers of car loans are rated on FICO scores that range from 300 to 850. Anything under 660 is generally deemed subprime. Cue the repo man … for the deadbeats’ cars … and the stock-sliding company. Note: GM shares are now about half of the IPO price. GM offers no-haggle prices … and a money-back guarantee. Losing ground to Toyota and needing to clear out end-of-model-year vehicles, GM will offer no-haggle pricing on 2012 Chevrolet cars and trucks plus a money-back guarantee on all new Chevys . The new promotions, which GM calls its Chevy Confidence program, address two things car shoppers dread: haggling and commitment. The no-haggle program pledges to offer 2012 vehicles at the “best possible prices” in addition to current incentives. The no-haggle sales price, called Total Confidence Pricing … harkens back to previous sales programs offered by GM. The company’s Saturn included no-haggle buying before the brand ended as part of GM’s bankruptcy reorganization in 2009. GM is trying to boost Chevy as the brand faces greater pressure from Toyota. U.S. sales of Chevrolet, GM’s largest brand, rose 6.3 percent to 961,662 cars and light trucks in the first half, a slower pace than the industrywide increase of 15 percent; Toyota’s namesake brand gained 29 percent to 937,964. Ken’s Note: Toyota faced what President Obama would call “headwinds” the past couple of years with a tsunami knocking out production for a few months, and Obama’s Secretary of Transportation calling Toyotas unsafe to drive … a hysterical charge that was never proven. GM CEO Dan Akerson is pushing the company to boost operating margins and strengthen Cadillac and Chevrolet as global brands. What do GM and Facebook have in common? Two high profile IPOs that have lost about of their value since their IPOs. Well, Facebook went out at $38 and closed at $38. The pundits are whining that the IPO was a failure because there wasn’t a big first day pop. My take: one of the rare times that the IB’s priced a deal at fair market value. Oh my, “flippers” didn’t get a chance to earn millions by just showing up for work. 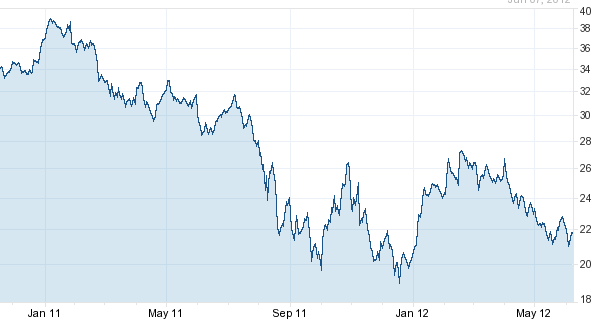 What I didn’t like about the Facebook IPO is that it got most analysts talking about the Government Motors IPO. 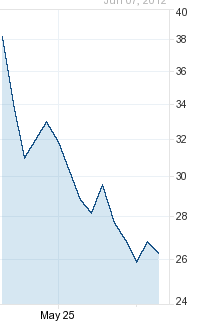 Oops, down almost 40% from the IPO price …. during a period when the overall market was up over 10%. 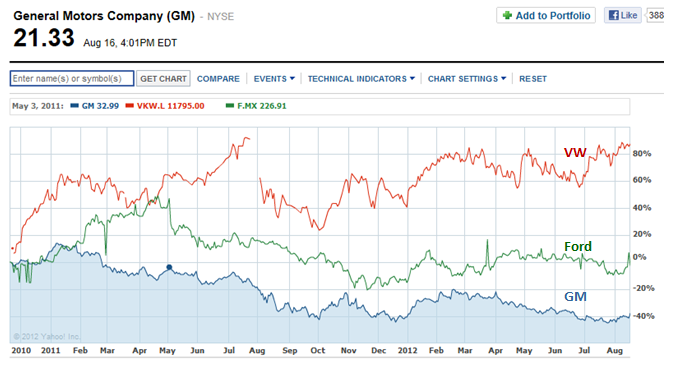 Geez, since Bin Laden is dead and GM is alive, why the stock dip? The company claimed record profits of $7.6 billion in 2011, the “highest profits in the 100 year history of that company” according to President Obama. And, the company paid no Federal income taxes on taxes those record earnings. Because New GM came out of bankruptcy “owning” all of the tax loss carry forwards from old GM. That’s not supposed to be allowed when a company goes through bankruptcy — a deterrent to companies trying to simply buy losses to offset some of their taxable earnings. The Obama administration quietly snuck in a special tax break for GM, which allows the company to write off approximately $45 billion in post-bankruptcy losses against post-bankruptcy profits. It’s good for twenty years. 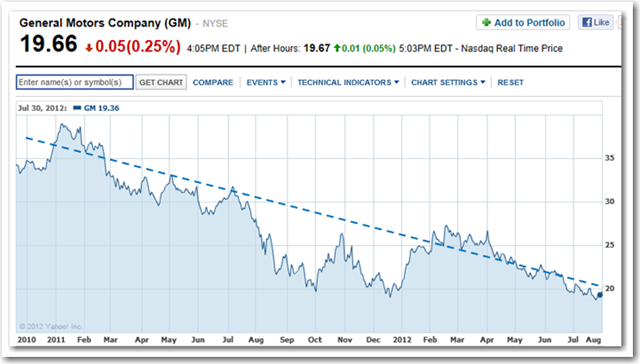 About that GM success story …. Team Obama is touting the rousing success of GM. You know, Bin Laden is dead; the UAW is alive. Oops, Imeant GM is alive. The original GM stockholders — you know, your grandma and the pension funds — got completely wiped out. The secured creditors got about 65% of their principal wiped out. And privileged folks got the opportunity to buy stock in the new GM. Those share have declined by 30% from the $33 IPO price ,,, a 50 point spread vs, the S&P 500 which increased 20% over the same period. That’s a loss of about $16 Billion in market cap in about 18 months. Now, that’s what I call a roaring success … many more successes and we really will be bankrupt. TakeAway: Recent study shows hybrid vehicles lack repeat purchasers. Only about one out of three hybrid vehicle owners chooses to buy another hybrid, according to a study by research firm Polk. The good news for automakers is that a high percentage of the return buyers remain loyal to the brand, even if they don’t buy another hybrid. In the case of hybrids, rising fuel prices, to more than $4 a gallon in some places, has so far had “little impact” on hybrid buying decisions, the report said. Ride, Sally, ride …. Mustang’s coming back. TakeAway: Ford’s Mustang brand is being refreshed to target Gen-Y consumers who have to taste the the freedom of driving. The Mustang today strongly hews to the look of the 1964 original. But Ford is working on radical makeover of its signature youth-market car, people familiar with Ford’s plans said. The next generation would retain the shark-nosed grille and round headlights, but would look more like the new Ford Fusion. The change is part of a bid to make the Mustang appeal to Generation Y, the roughly 80 million people who were born between 1980 and 1999. This demographic group is entering its peak car-buying years. For Ford, Gen Y may prove a difficult target. For many in this group, cars and driving just aren’t that cool in an era of iPads and Facebook. A 2011 study by the University of Michigan found that just two-thirds of all 18-year-olds had driver’s licenses in 2008, down from 80% in 1983. WSJ reports that despite advertising galore, Chevy has sold under 10,000 of the green machines so far — less than 1,000 per month — and GM has decided to idle production of the battery-powered car for five weeks. The plant had just resumed production on Feb. 6 after a prolonged holiday shutdown. Former GM Vice Chairman Bob Lutz the main force behind the Volt, said recently that GM’s lofty targets for the Volt are its main problem. In other words, great dog food …. it’s just that the dogs aren’t eating it. Question: How many total hybrid cars or trucks sold in the US are Toyota Priuses? Toyota hopes to grow its share of the hybrid market with new product launches, such as the Prius C – “c” for city, to attract young buyers. Toyota showed off its new Prius c — the “c” in the name is for city — a small entry in its growing “family” of Prius hybrids, and bowed its NS4 concept plug-in hybrid that should see the market around 2015. … Toyota is reaffirming its commitment to the long-term future of a type of propulsion that it pioneered with the Prius hybrid. Toyota also plans to introduce a “plug-in” Prius, a la the Chevrolet Volt, sometime this year, as well as a Scion iQ EV and a second generation of its Toyota RAV4 EV, an SUV, in small volumes. “Young buyers on a budget have seen hybrids as out of reach… The next three years … will be a critical period for gauging consumer interest in other advanced technologies. Looks like a hybrid, runs like a hybrid … it’s eAssist. Punch line: Buick is ducking some common perceptions by calling its new LaCrosse hybrid a “LaCrosse with eAssist”. American consumers remain decidedly lukewarm to hybrid vehicles. “So for us, the focus was to put an emphasis on the car itself and what this car delivers and how technology enhances the ownership experience. For example, Buick and its dealers are emphasizing: the quiet ride… and the car’s “start-stop” capability which halts operation of the engine at stoplights, saving fuel, and then starts it up again when the driver punches the accelerator. That’ll fool a lot of folks, won’t it? Good riddance: Electric car subsidies expire … at least, some of them. The 45-cent-per-gallon tax credit for corn-based ethanol. A credit that gave electric-car owners up to $1,000 to defray the cost of installing a 220-volt charging device in their homes. But, he $7,500 tax credit that the government offers purchasers of electric vehicles did not expire at year’s end. The Obama administration says that the credit helps build a market for EVs, which helps create jobs. Sales of electric vehicles were disappointing in 2011, with the Volt coming in below the 10,000 units forecast. Evidence is mounting that President Obama was overly optimistic to pledge that there would be 1 million EVs on the road by 2015. More prosaic fuel-economy innovations such as conventional hybrids, clean-diesel cars and advanced gasoline engines all show much more promise than electrics. PepsoCo’s Frito-Lay North America has turned the ignition on ten new electric trucks in Orlando. The electric delivery trucks are set to be part of the largest planned fleet of commercial all-electric trucks in North America. Frito-Lay plans to deploy 176 electric trucks this year, making them the largest commercial fleet of all-electric trucks in North America. The trucks are by Smith Electric Vehicles, and designed to operate at peak effectiveness in urban environments. The trucks generate zero tailpipe emissions and each truck emits 75 percent less greenhouse gases than a conventional diesel truck. The trucks operate for up to 100 miles on a single charge. GM: The Volt isn’t about how many you sell … say, what? The company sold 1,139 Volts in November, bringing sales to 6,142 this year. GM will miss a target to sell 10,000 Volts in 2011. GM has 134 day’s supply of the Volt, while the Nissan has a 21 day supply of the Leaf, the only other electric car on sale in the U.S. mass market. GM offered to buy back Volts from any owner who fears the car is a fire risk amid a U.S. safety investigation of its lithium-ion battery. More precisely, GM will launch it’s first all electric car – the Spark — in the U.S. in 2013. Technical note: the Volt is a combo electric with an ICE (internal combustion engine) in reserve. GM will sell its first production all-electric car in the U.S. in 2013. It will be battery EV version of the coming Spark mini-car. The Spark is a tiny city car that is smaller than Chevy’s new subcompact Sonic. The EV version will be sold in “limited quantities” in select U.S. markets. Ken’s Take: “Limited quantities” ? I’m betting the under. Chevy Volt’s battery catches fire … oops. The Detroit Free Press reports that a Chevrolet Volt caught fire several weeks after a crash test. The electric vehicle had been subjected to a low speed (20 mile-per-hour), side-impact test for its crash safety rating. Apparently, the crash punctured the Volt’s lithium-ion battery, and though it took a couple of weeks, the vehicle eventually self-combusted – i.e. it went up in flames. General Motors believes the fire occurred because the testers didn’t drain the energy from the Volt’s battery following the crash, which is a safety step the automaker recommends. Government officials are weighing the need for new safety rules that could require first responders to drain electric vehicles’ batteries after a crash. Note, they’re not investigating how to make the Volt safer, they’re determining whether fire-fighters have to drain the batteries when they arrive at an accident scene. The U.S. Treasury aimed to sell more of its 26.5% stake in GM by August or September. Then, the stock started tanking. GM stock would need to hit $53 a share for the U.S government to break even on its $50 billion bailout of the auto maker. At $30 a share, the U.S. would lose more than $10 billion on its $50 billion bailout of GM. Than makes the loss about $15 billion … but, who’s counting? To avoid the Gibson Guitars treatment, Ford pulls anti-bailout ad. Team Obama didn’t like the ad, and Ford pulled it so that Team Obama could stay focused on Gibson Guitars, S&P, and the tanning salons. Ford pulled the ad after individuals inside the White House questioned whether the copy was publicly denigrating the controversial bailout policy. The ad, pulled in response to White House “questions” (and, presumably, carping from rival GM), threatened to rekindle the negative (if accurate) association just when the president wants credit for their positive results and to distance himself from any public downside of his decision. In other words, where presidential politics and automotive marketing collide — clean, green, politically correct vehicles not included — the president wins and the automaker loses because the benefit of the battle isn’t worth the cost of waging it. Once again, nothing like the Administration’s Chicago style politics. Step out of line, and BAM ! Ford ads a new benefit: buying from a company that stands on its own. Punch line: Ford hit the airwaves with a potentially controversial ad touting the fact that it’s an American company that stands on its own … unlike its bailed out competitors. America is still fighting over President Obama’s costly bailout of Chrysler and General Motors. Especially the owners of Ford, the only member of Detroit’s “Big Three” who rejected the government dole and emerged perfectly healthy. In its most political ad in the so-called “Drive One” ads where real drivers are thrust before cameras to explain why they picked Ford, a real Ford F-150 pick-up driver is featured. “I wasn’t going to buy another car that was bailed out by our government. I was going to buy from a manufacturer that’s standing on their own: win, lose, or draw. That’s what America is about is taking the chance to succeed and understanding when you fail that you gotta’ pick yourself up and go back to work. Timmy shelves the sale of GM shares … for now, at least. The Obama administration has put on hold plans to sell the rest of its stake in GM because the auto maker’s shares have slumped this year. 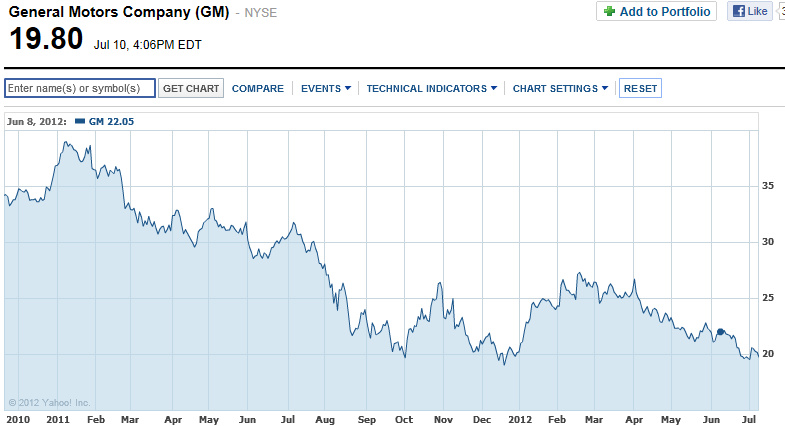 So far this year, GM stock is down 31%. On Tuesday, GM stock closed at $25.54, up 97 cents. How many Chevy Volts sold in July? Despite thousands of dollars of government rebates, GM’s Chevrolet Division sold just 125 Volts in July — the worst monthly total for the Volt since it was introduced last year. Birth-to-date, GM has sold only 3,196 units …Haven’t heard much about the Volt lately – have you? Remember the Feds stake in GM ? 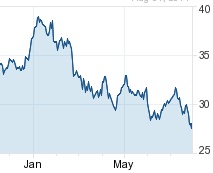 Bad news: Stock closed on Aug. 2 at $27.05 … approximately 20% below the IPO price … about a $13 Billion loss. When the history is written on Pres. Obama’s strained relationship with American business leaders, I think that the GM non-bankruptcy bankruptcy will be tagged as the the first critical shot fired (by the President). Many experts suspect that GM could have obtained private bankruptcy financing if it had presented a credible restructuring plan addressing the cause of its malaise: the uncompetitive costs of its unionized work force. If it couldn’t, then the government could have offered guarantees to private lenders for the amounts they loaned, which likely would have been smaller than the bailout. But the administration took matters in its own hands, using taxpayer dollars to commandeer the bankruptcy process to protect key constituencies, while giving short shrift to others. It gave Chrysler’s secured creditors, who would have had priority in a normal bankruptcy, 29 cents on the dollar. Chrysler’s unions, on the other hand, got more than 40 cents, even though they are equivalent to low-priority lenders. This made a mockery of longstanding bankruptcy law, something that will make credit markets wary of lending to political sacred cows in the future. I think CEOs could have lived with Obama firing Richard Waggoner as CEO … and then firing his replacement, Fritz Henderson … and then firing his replacement, Ed Whitacre. But, ignoring the rule of law and subordinating secured creditors to one of Obama’s core constituencies — overpaid union hacks – was over the top. Hybrid car sales respond to high gas prices … with a thud. The last time that gas prices soared, hybrid cars were selling above their sticker prices. According to USA Today, hybrid sales fell to only 1.6% of total auto sales – down from their 3.6% peak in 2009. Sure, gas prices hit $4, creating “economic value” versus conventional gas-engine cars … but the fuel savings has narrowed with the introduction of compacts that get 40 mpg and sell for considerably less than hybrids. Sales of high-gas-mileage, conventional compacts such as the Hyundai Elantra, Ford Focus and Chevrolet Cruze are hot. The new conventionally powered cars use various strategies to boost gas mileage to near hybrid levels — without the batteries and electric motors that can add $6,000 on average to a vehicle’s cost. Volt update: Chevy sold 481 Volts in May … pushing it’s total since January up to a whopping 2,184. Consumer Reports says GM’s hybrid “just doesn’t make a lot of sense.” … ouch. Where are the lemon laws when you need them? Here’s a shocker: even a reconstituted company that’s stuck with the UAW doesn’t do very well. GM had been showing some life, largely on the back of fuel guzzling pick-ups and SUVs. But, increasing gas prices have (again) slowed that market down. The U.S. government plans to sell a significant share of its remaining stake in GM. this summer despite the disappointing performance of the auto maker’s stock. A sale within the next several months would almost certainly mean U.S. taxpayers will take a loss on their $50 billion rescue of the Detroit auto maker in 2009. To break even, the U.S. Treasury would need to sell its remaining stake — about 500 million shares—at $53 apiece. 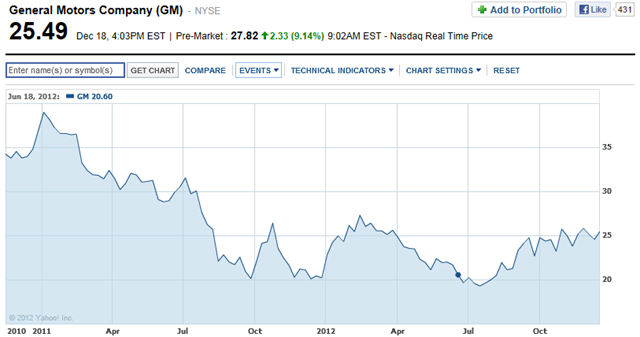 GM closed at $29.59 in trading Tuesday, hitting a new low since its $33-a-share November initial public offering. Analysts say that GM shares have been hurt by rising fuel prices, industry production disruptions and management turnover. GM share price could become further depressed after investors holding bonds of the now-bankrupt “old-GM” receive warrants and stock for existing GM shares. That will happen April 21. Remember when the Secretary of Transportation took to the airwaves to to tell people not to buy or drive Toyotas because they were unsafe? Turned out that the problem was an auto service guy sticking the wrong floor mat in a car and a couple of folks hitting the accelerator instead of the brake. But, since the gov’t owned GM — one of Toyota’s main competitors — LaHood just let it fly. The Chevy Cruze is being recalled because its steering wheel comes off. That’s right. it steering wheel can become detached. No driver error. No servicing mistake. The steering wheel comes off. Do you think LaHood will issue another driver’s alert? The solution is high-speed rail … what, pray tell, is the problem? Seriously, have you heard anybody (except Reid & Obama) say “man, what this country needs is a $53 billion “national high-speed rail system” ? Except for connecting liberal bastions DC, NYC and Boston .., and Disneyland and Las Vegas … I can’t figure out where it would run … and more important, who would ride it ? The rail proposal casts doubt on the administration’s commitment to reducing huge budget deficits. High-speed rail would definitely be big. Transportation Secretary Ray LaHood has estimated the administration’s ultimate goal – bringing high-speed rail to 80 percent of the population – could cost $500 billion over 25 years. For this stupendous sum, there would be scant public benefits. Precisely the opposite. Rail subsidies would threaten funding for more pressing public needs: schools, police, defense. How can we know this? History, for starters. In 1970, Congress created Amtrak to preserve intercity passenger trains. The idea was that the system would become profitable and self-sustaining after an initial infusion of federal money. This never happened. Amtrak has swallowed $35 billion in subsidies, and they’re increasing by more than $1 billion annually. Despite the subsidies, Amtrak does not provide low-cost transportation. Fares on Amtrak’s high-speed Acela start at $139 one-way; A comparable roundtrip bus fare: $21.50. Nor does Amtrak do much to relieve congestion, cut oil use, reduce pollution or eliminate greenhouse gases. Its traffic volumes are simply too small to matter. Measured by passenger-miles traveled, Amtrak represents one-tenth of 1 percent of the national total. The reasons passenger rail service doesn’t work in America are well-known: Interstate highways shorten many trip times; suburbanization has fragmented destination points; air travel is quicker and more flexible for long distances. Even if ridership increased fifteenfold over Amtrak levels, the effects on congestion, national fuel consumption and emissions would still be trivial. What’s disheartening about the Obama administration’s embrace of high-speed rail is that it ignores history, evidence and logic. The case against it is overwhelming. High-speed rail is not an “investment in the future”; it’s mostly a waste of money. Simple question: Why hasn’t Obama fired Ray LaHood? Ray LaHood is Obama’s Transportation Secretary. The guy who excorciated Toyota for making unsafe cars. No investigation. Just anecdotes and ambulance chasers. Toyota loses millions. 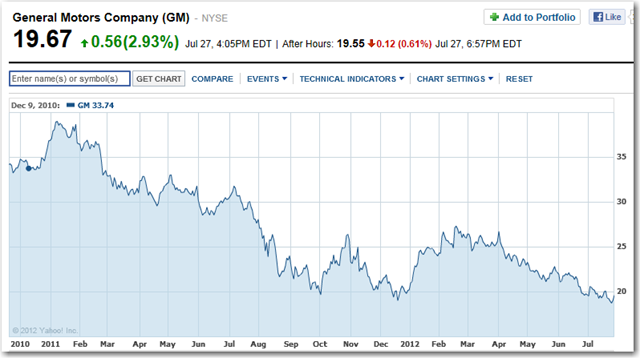 Government-owned GM surges. Now, it’s “pedal misapplication”. Not electronics. Either LaHodd is totally irresponsible or frightfully conniving. Let’s see if Obama has the moral clarity and ‘nads to do what’s right. GM’s UAW workers get windfall bonus … and, oh yeah, Toyota’s innocent. Yesterday, there were 2 seemingly unrelated news stories … I say ‘seemingly’ because the mainstream media hasn’t picked up on the connection. First, the WSJ reported that GM (aka, Government Motors) is planning to pay its hourly workers at least $3,000 each in profit-sharing payouts, the largest amount ever. Why? Because the company miraculously returned to profitability in 2010. The profit-sharing checks will go to 45,000 workers as part of the auto maker’s contract with the United Auto Workers union. Now, let’s stop and think for a moment. How did GM return to profitability? First, GM wiped out shareholders and – completely ignoring contract law — moved the union pension claims ahead of its bona fide secured creditors. Get rid of your debt – and its related interest – and your economics change a bit. Then, toss a couple of billion dollars of excess plants & equipment into a new corporate entity … just get it off your books. Then, have one of your owners – in this case the Federal government – make some bogus claims against one of your major competitors. Maybe have the President and Secretary of Transportation declare that the competitor’s cars are unsafe to drive. That might dampen their sales … and increase your’s. So what if the claims are largely unfounded. Go for it. Now, for the other news story. The WSJ reported that NASA and the National Highway Traffic Safety Administration conducted a 10-month-long study on Toyota’s apparent acceleration problems. Based on the study they absolved the electronics in Toyota’s vehicles for unintended acceleration, and said driver error was to blame for most of the incidents. 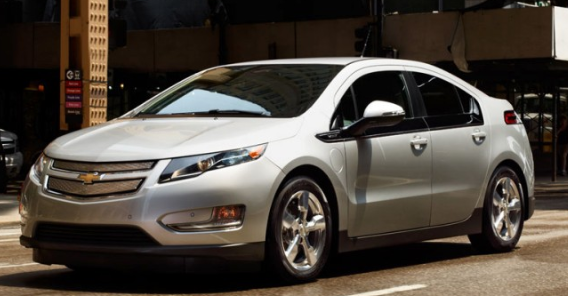 Does the Volt have enough power to cross the chasm? TakeAway: Like many new, innovative products, there is an adoption chasm between the early adopters and the early majority. While the new Chevy Volt has already demonstrated appeal to the early tech adopters, there are some issues that could spell trouble. One, the short battery range doesn’t really offer a complete solution to eliminating the need for gasoline. Two, once you have exhausted the battery, it’s just another car. Until the battery technology improves, the “killer application” seems to be lacking. GM has high hopes that the Volt will be adopted by a mainstream audience. “Today a lot of our customers are early tech adopters — typically the first on the block to have an iPhone or an iPad,” says Tony DiSalle, the head of marketing for the Chevy Volt. He thinks those numbers will improve over time. “The most important thing is to get consumers — mass-market consumers — to understand the benefits of the Volt,” DiSalle says. One of the barriers to the adoption of the electric car is a phrase that keeps coming up at the auto show — range anxiety. Many of the cars on display can only travel under electric power for short ranges. Analysts say that until the big car companies can conquer consumer fears of running out of charge, electric vehicles will remain on the fringes. “Look, the electrification of the American fleet is not going to happen overnight,” says Bob Lutz, who retired as vice chairman of GM in May. Interesting article in Business Week titled “Electric Cars Get Charged for Battle” … worth reading. P.S. Is it just me, or has Business Week been swinging left since being bought by Bloomberg? After 10 years as the world leader in hybrids, Toyota has never sold more than 187,000 Priuses in the U.S. in a year. Prius sales peaked in 2007, just before the financial meltdown, and have dropped since then as fuel prices retreated. 78% of drivers go less than 40 miles daily; 95% drive fewer than 100 miles a day. The best guess is that 80 percent of charging will take place at home. Charging an electric car with a standard 120-volt outlet can take up to 18 hours; 5 to 8 hours to charge one with a more powerful 240-volt outlet. But, buying a 240-volt charger requires contacting a utility to see if the neighborhood transformer can handle the load, getting a contractor to install the 240-volt charger in your garage, and having the city inspect it. It can cost anywhere from a few hundred dollars to $3,000 and take a month or two. Nissan sorted potential launch markets according to three main criteria. (1) places that had EV incentives left over from the late 1990s-early 2000s. (3) states where the local utilities were willing to upgrade their grids if needed. Wave One: Washington, Oregon, California, Arizona, Tennessee, Texas, and Hawaii.